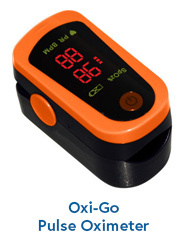 Pilot Holiday / Christmas Gift Guide - Top 100! To help give you some places to start shopping, we've hand-picked 100 different items from our inventory that will make a great gift for the aviator in your life. There's something for any budget in this Top 100 list. If you're still having a hard time deciding, call us toll-free at 1-877-314-7575 and let one our staff pilots help guide you in the right direction. 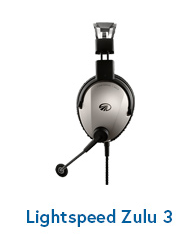 Delivers an unmatched combination of full-spectrum noise reduction, comfortable fit and clearer sound. A 10 Hour Aviation Ground School on Widescreen DVD - also includes the Private Pilot PrepWare software! This handcrafted, truly unique, airplane bottle opener will be the hit of your hangar or den. Adds support for NEXRAD imaging and XM satellite weather capabilities, detailed terrain mapping, and a Panel page. Stream music and cell phone to your aviation headset with a 3.5mm stereo input via Bluetooth wireless. Dual color (Red and White) High Powered 13 LED Flashlight. One of the most perfect lights for aviation! Any aviation buff will enjoy these 1" wingspan, silver jet shaped paper clips. 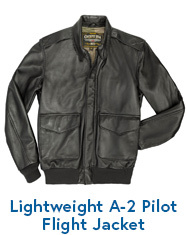 Since 1938 the type G-1 flight jacket has been regulation issue gear to pilots of the United States Navy. A rich resource for active instructors. Lesson plans for flight instructors in the form of scenario-based maneuver briefings. Based around a 10 hour DVD video course, this private pilot training kit will take you from your first lesson to your license. Comprehensive preparation and study software for the Private Pilot, Recreational Pilot, and Sport Pilot FAA Knowledge Exams. Keep track of your Airplane Keys with this heavy duty embroidered ribbon keychain. 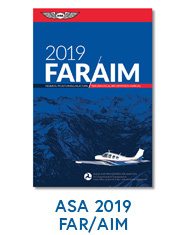 Designed for lifetime durability, this 96-page permanent record offers large flight time category spaces, arranged according to FAA regulations. This 14 oz. stainless steel, double-wall insulated mug, helps your personal fuel stay hot or cold in either the hangar or the air. A set of six vintage aircraft instrument coasters. This nickel plated airplane bottle stopper will add some playfulness & class to your favorite bottle of wine! Accurately calculate time to the next waypoint, fuel tank changes, turns in holding or an instrument approach with complete confidence. Covers everything from WW II, to 100 years of commercial flight, to aircraft tires, maintenace and much much more. 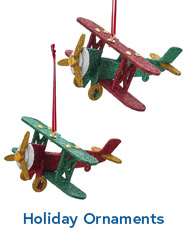 This legendary American airplane will be right at home on any aviators tree. 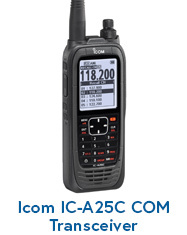 Master VFR Communications on your computer! Let your passengers know that you'll never forget where the flaps, ailerons, or horizontal stabilizer are located while wearing this shirt. This nickel plated airplane bottle opener will be the hit of your hangar (and will make that beer taste that much better)! This unique handcrafted airplane wine stopper will be a huge hit at your next dinner event! Wear your passion for flying on your wrist with these fantastic airplane cufflinks. This WWI propeller has a working clock in the engine shaft hole. At almost 4 feet long, this will become the centerpiece of your office or den. Comprehensive orientation to aviation — find out what's involved with learning to fly and earning a pilot's license. 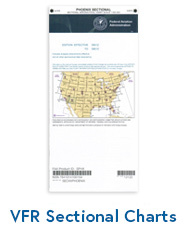 This fully padded logbook cover is perfect for protecting your smaller ASA or Jeppesen Pilot Logbook. One of the most talked-about films of the year, One Six Right is an inspiration for both pilots and the non-flying public. The new LightSPEED Sierra Headset offers unique Lightspeed features such as integrated Bluetooth wireless interface at a price that can't be beat! AeroShell Flight Jacket has everything you need to keep your aircraft properly cleaned, detailed and protected! Great looking high wing airplane clock! This unique wine caddy will serve as a great conversation piece starter! These nickel plated airplane coaster set looks like it came directly off of an actual instrument panel! Innovative, 3-in-1 iPad mini mount can be standalone, clipped to kneeboard band, or attached to a RAM mounting solution. 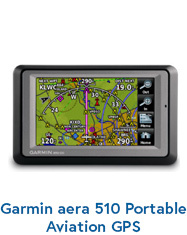 The Sky High Gear Mini-G iPad Mini kneeboard & case has been made to fit the iPad Mini and all port locations. This Multi Tool is packed with practical tools and 2 built-in LED lights to illuminate work surfaces. 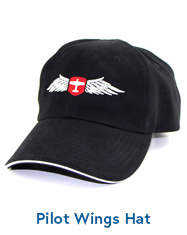 Show the world that you are a super fly girl with a passion for aviation! Eight Hours Between Bottle and Throttle shot glasses are a welcome addition to any round of hangar talk. A serious text written in a fun and witty style. 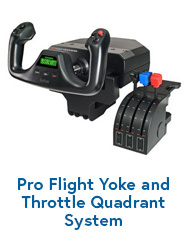 A comprehensive kit for Instrument and Commercial pilots in Part 61 training. The 1920 Era Flight Mobile Airplanes are handcrafted planes modeled after some of the most legendary and iconic throughout history. A variety of small airplanes tightly patterning the 100% silk tie on a navy blue background. Keep a colorful Glass Cockpit on your desk for those days when you can't be cutting holes in the sky. 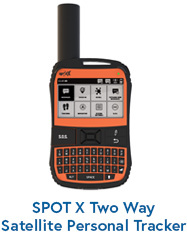 Provides fast, reliable, and accurate GPS position information to almost any application on the iPad, Android, Blackberry and more. Get all 13 episodes from Season 1, 2, and 3 of The Aviators TV! 39 episodes total in one money saving bundle! From Alpha to Zulu and everything in between, this unique hooded sweatshirt uses the entire ICAO Phonetic Alphabet to form an airplane. This heavy duty Keychain is embroidered on both sides and bound on all four sides. Silk screened - red / white. 100% cotton. This unique red airplane ceiling fan pull will put the finishing touch on your airplane themed room. Hand-made leather log book cover that will protect your logbook for many years and flying adventures yet to come. Good looking wall clock. Great gift idea! Signs of Flight T-Shirt with an aircraft Silhouette on a dark brown background. A small sealable bag for liquid waste. Designed for use by men, women, and children. Hand made in the USA using heavy gauge american steel. Pilot on Duty - 14 inches x 8 inches. Some aviators have six pack abs. Some enjoy a six pack of beer. But, all aviators look forward to their six pack of instruments. Old fashioned tin cookie cutter that make airplane cookies! 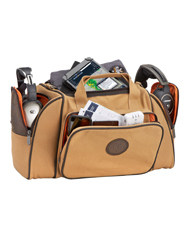 Same features as the Student Pilot Bag but larger. Great for laptops, iPads, flight cases, or even your car. European Style sticker to show your love of aviation. High quality Brushed Cotton Twill 6 panel baseball caps without a button on top - easier to wear with headsets! Colorful and fun. A VFR Sectional Chart of your choosing on your mousepad.